I'm barely going to make this out by the end of 2013, but I should continue my streak at 2 years, (3 out of 4!). If you want to review my last two updates, you can see the update for 2010 and the update for 2012. With that out of the way, 2013 started with a mini-college reunion trip to Utah for a weekend of skiing. 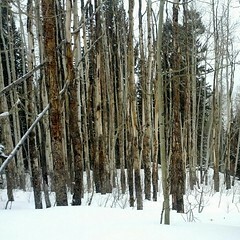 Ten of us rented a house and got to enjoy an excellent snow weekend at Solitude mountain. This proved to be the best snow conditions I'd get to experience in all of 2013. Little did I know in January, but California was going to get almost no more snow, for the rest of the year. In fact, this year is the driest year on record for (Northern) California. There is at least a prediction for some snow in Tahoe at the beginning of January 2014, so maybe our fortunes will turn around. While in Utah, I took the opportunity to visit one of my oldest friends, Kevin Bell in a nearby city. I spent several days with him, his wife Jessie, their awesome daughter Lexi and their newborn son Kai. It was the second time I'd visited Kevin out there, though this time he was married and had kids. 2013 also brought about a change of living; I moved to San Francisco into a great apartment with my friends Dylan and Sunny. 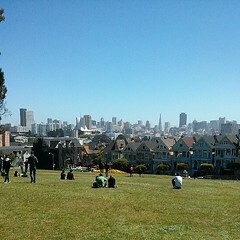 The apartment is in a really awesome area of the city, near the famous Alamo Square. If you follow me on Facebook or Instagram, I'm sure you've seen some of my photos of the cliched painted ladies scene. It is hard to not take photos of the area on nice days! The rest of the winter was pretty uneventful because, as I mentioned, there was no snow in Tahoe. However, I started the spring with a series of camping trips to Big Sur, Sonora and other outdoor activities. In fact, I went a full 5 weeks where I got poison oak in a new place on me. Each weekend, I'd get poison oak somewhere, then it'd heal up before the next weekend when I'd get it again. Yes, spring came early this year. 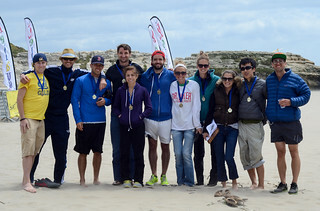 In May, Team Victorious Secret was back at it, running The Relay; a 12 person group run from Calistoga to Santa Cruz. Last year, we almost broke the 24 hour barrier, and we really wanted to this year. It didn't look like we'd make our goal early in the race, but as the miles clocked down, we realized that we were actually on track to demolish the goal! With an average time of 7:24 min/mi over 191 miles, we finished in 23 hours, 34 minutes. Good enough for 9th fastest team overall (out of 190). The race was tons of fun, and our team raised funds to help support organ donation. June began in Budapest with my good friends Dean Eckles and Ben Mathes. Some friends were getting married in Istanbul in June, and we took a slight detour on the way there to visit the city of Budapest. I wrote more about Budapest on my website, but suffice it to say that I had no idea what to expect when we picked to go to the city. We originally just recognized the city when we were looking for short non-stop flights from Istanbul. And then the city really impressed me with its history and beauty. Hungarians are also really into cured meats, which of course resonated well with me. I posted photos from Budapest on Flickr and on Facebook. During June this year, Northern Europe was pounded by heavy rain storms. Budapest escaped most of the rain, but also sits downstream on the Danube river from the locations that received lots of rain. So while we were in Budapest, the Danube was continually rising, eventually peaking at 8.91 meters above normal levels, which set a new record for the city. Luckily, most of the city was spared. Dean, Ben and I then continued the second half of the trip in Istanbul, and spent a whirlwind 4 full days in Istanbul. After my time there, Istanbul is easily one of my top cities to visit now; the combination of an extremely rich history, modern conveniences, location in the world and excellent food, makes Istanbul a place I could even see myself living for some amount of time. Adding to the already rich intrigue of the city, we arrived in the middle of some of the largest political protests seen in Istanbul in many years. In fact, we were staying just a short walking distance from ground zero of the protests. You may have heard of the protests at Gezi Park, and we were staying within a 15 minute walk from there. The protests provided us with a unique opportunity to really learn more about the culture, politics and history of the city and country, and we took full advantage. I took a number of photos of the protests as well. A trip to Istanbul wouldn't be complete without much of the usual sightseeing one must do. I saw the Hagia Sofia, Blue Mosque, Grand Bazaar, the spice market, countless other mosques, churches, markets, palaces and generally wandering the large network of streets and alleys. In addition, I attended the beautiful wedding that sparked the original reason for the trip in the first place. The venue was a beautiful location, next to the famous Ortaköy Mosque on the Bosphorus. The ceremony was very different from traditional American weddings, and lasted about 10 minutes. Turkish weddings are secular, where the main part of the ceremony is the bride and groom each signing a document in front of everyone. In fact, I was standing for the whole ceremony. After the ceremony though, the reception was much more traditional, with eating and dancing late into the night. 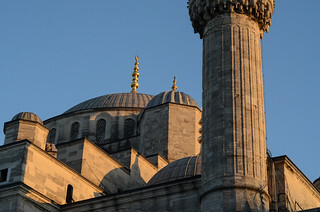 You can see more photos of my trip to Istanbul on Flickr or on Facebook. 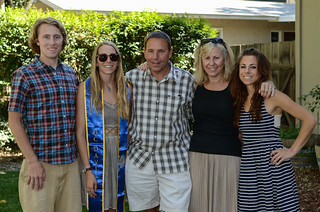 As soon as I got back from Europe, I was off again to Davis, where my youngest sister, Megan, graduated from UC Davis. Megan earned her Bachelors in Textiles & Clothing. Megan has been putting her degree to work with her Etsy store, making full use of her industrial sewing machine to make bags, backpacks and lots of other gear. June also saw me traveling to Chicago for another graduation; my good friend Rachel earned her MBA from Northwestern's Kellogg School of Management. I'd never been to Chicago proper, and got to see a lot of the city. The architecture there is incredibly impressive and gave me an appreciation for building architecture and the history of architecture's progression even in other cities. In July, after many many delays, I became a homeowner with my other sister, Amy. Her and I came across a house near Grass Valley and decided to take the plunge and made an offer in June (right before my Europe trip - I was signing documents electronically from Budapest!). In mid July, the house closed and then we began the long road of renovating. We knew the house needed some work, but damn, did we underestimate how much time that work would take (plus we added more work along the way). Over the course of the next 4 months, her and I, with the enormous help from our parents (seriously, we couldn't have done it without them), spent most weekends, and some weeknights, working on the house. We replaced a lot of the electrical system, repainted the entire inside, replaced the water pipes, installed cabinets in the kitchen my Dad built, put a new floor in the kitchen, re-tiled the bathroom, and tons of other smaller stuff that quickly added up time. All the hard work paid off though, and the house really looks awesome now. We still have some more things we want to do, but it is all mostly on the outside, and we're done for now. We did take a break in September to visit Yosemite with friends and family in what has become an annual tradition. The weather was excellent, and provided a great break with hiking and relaxing. If there is a theme to 2013 for me at all, it would have to be making big life changing decisions. I moved to San Francisco, then later, bought a house, and in October, finally committed to getting a dog. I have wanted to get a dog for years, and have even had a name picked out for at least five years (probably longer). 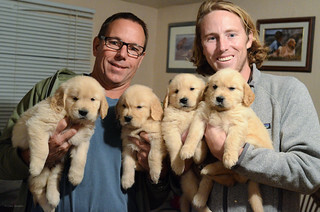 Specifically, I've wanted to get a golden retriever puppy and name him Rowdy. 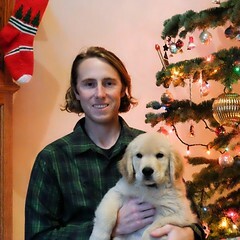 I found a breeder in Reno, who had puppies born in mid-October and next thing I knew, I was scheduled to get my puppy, Rowdy, on December 6th. I visited Rowdy and his brothers and sisters twice; once at 3 weeks, and once at 6 weeks. At 8 weeks, I picked up Rowdy and it has been amazing ever since. A puppy certainly brings lots of changes and lots of work, but Rowdy is a great puppy. He has been sleeping throughout the night, his house training is coming along well, and he is starting to learn various commands. My current task is to figure out how to get him to stop chewing on my feet and ankles, which he currently loves to do. I've tried not to spam my social networks with too many photos of Rowdy, so I created a separate Instagram account for him, which you can follow if you want to see more regular photos and videos of him. December of 2013 also marked a big milestone for Educreations; the company turned three years old. The journey to get to three has been full of ups and downs, and has allowed me to learn more and grow more than at any other place I've worked before. We've been installed on millions of iPads, seen millions of lessons created and affected students and teachers around the world. It's hard to describe everything that three years means to me, but Educreations is truly is a thing I love working on and at, and am looking forward to the future. As is the case with these updates, they go on much longer than I anticipate. More definitely happened, and I tried to keep this shorter, so if you want to hear more, lets catch up! I wasn't very good about writing on my site this year, so you may or may not be able to keep up with me next year at chrisstreeter.com. You can also find me on Facebook, Twitter or through my photos on Flickr or Instagram. I'd love to hear how your 2013 went, so write back. Hope your 2013 was a good one and all the best next year.